Hello sports-a-rama fans, and it goes without saying that we say from Mars: Congratulations and Celebrations to Chloe Esposito, a true all-rounder. Go you good thing, as we say in the Martian classics. 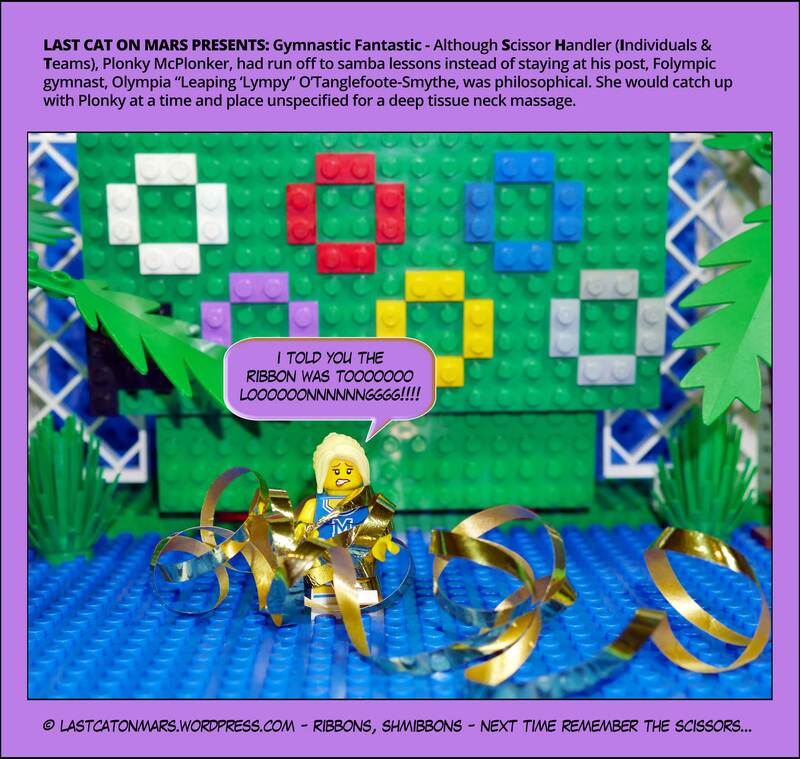 Wait, you’ve already been and gone – yippeekyay from far away!!!!! 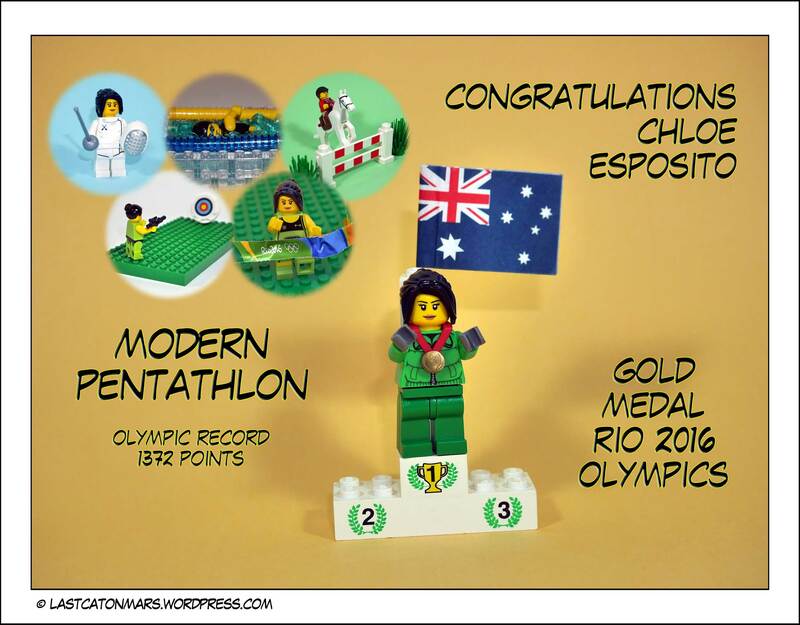 This entry was posted in F-Olympic Games 2016, Special Occasions and tagged cartoon, Chloe Esposito, comic, gold medal, lego, modern penthathlon, olympic record, Olympics, Rio 2016 on August 20, 2016 by Jay Verney. Who doesn’t love a self-regarding, supercilious super being? Don’t answer that. 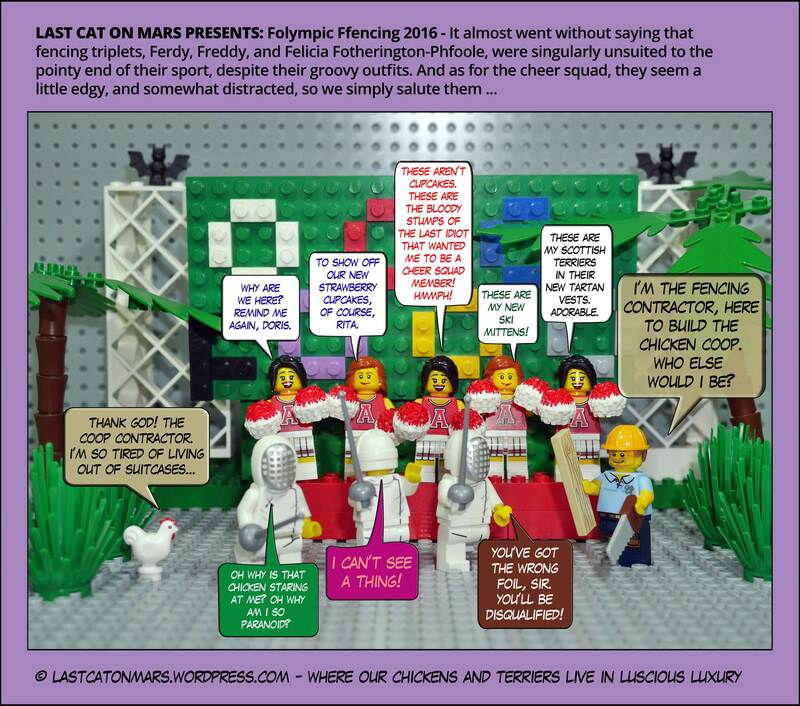 The Folympics welcomes all-comers, even the maintenance persons of the globe, and especially Julio, who reminds me of my beloved Daddy, Papa On Mars. He, too, could paint up a storm. I well remember one lazy Saturday afternoon when Papa decided to paint my bedroom (which was actually a sleepout, but let’s not quibble about childhood traumas here). Dispensing with the need to move furniture or mirrors or other paraphernalia out of the way, Papa simply painted around them all, and had the job done in double, even triple quick time. Which was just as well, since we sold the joint the following week. Goodness only knows what the new owners thought of their slightly abstract, slightly not-painted-at-all-really sleepout/bedroom of mine. What japes we had wondering about it on many a moonlit night before our Martian adventure. 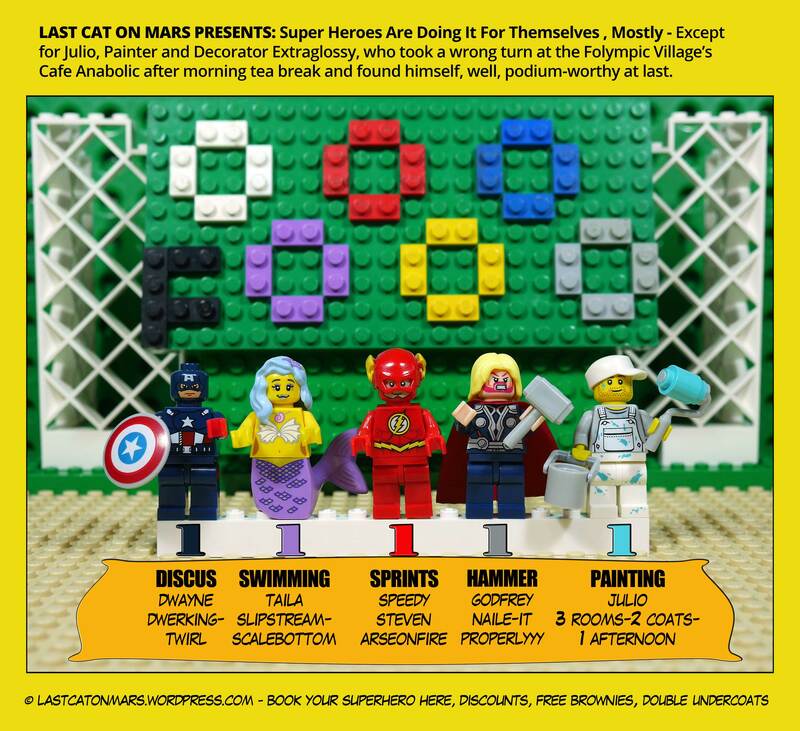 This entry was posted in F-Olympic Games 2016, Special Occasions and tagged cartoon, comic, discus, hammer, lego, minifigures, Olympics, painting, Rio 2016, sprints, super heroes, swimming on August 17, 2016 by Jay Verney.